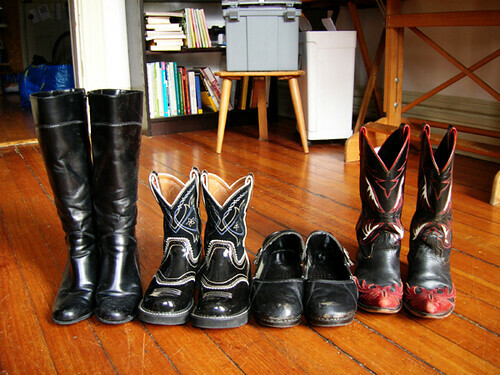 L to R: 1) My knee high black boots, my first pair of knee high boots. They're not warm enough for winter, though. I'm done wearing heels, too. Next winter I will be looking for flat, wide shaft, knee high black snowboots. Maybe Hunter boots with liners. 2) My fat babys for spring, breaking in nicely. 3) Just awful, my Dansko mary janes. SO OLD, I've seriously had these since ...2004? I haven't replaced them because I was wearing my knee high boots to work year round, and then last summer I was riding my bike to work and wearing the no show socks and gym shoes with everything. But I might not ride my bike to work this summer, because now I work in the Marquette Building. Which is right at the Monroe Blue Line stop, like the building is practically at the top of the stairs. And the train is fast, I didn't believe that the train was faster than the bus. Plus I generally would rather travel in sunshine and walk the extra block. But once I realized I could sleep for fifteen more minutes, the genie was out of the bottle for good. 4) My awesome cowboy boots that I got from B, but they might pinch my toes too much for everyday wear.